It’s common knowledge that running is a high-impact sport. Approximately three times the runner’s weight is imparted into the ground on every step. And the legs impart energy as they push and pull over the ground. That’s a lot of energy. What if you could translate that energy into electricity? Could we use it to light up some homes? That’s exactly what the race organizers of the Paris Marathon were thinking this year. The race sponsor, Schneider Electric SA, in conjunction with Pavegen Systems Litd. 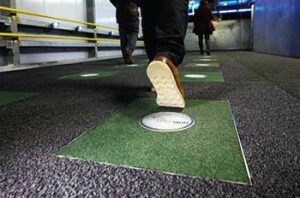 of the United Kingdom, conducted a test using flexible, energy-harvesting tiles, made from recycled truck tires. Laid across a 25 meter section of the Champs Elysees, the tiles were designed to convert some of the kinetic energy that each footstep generates. The tiles work by flexing about 5mm on every footstep, which can generate up to 8 watts of kinetic energy. The resulting energy was fed back into batteries. The 40,000 runners who participated in the race generated 4.7 kilowatt hours of energy, enough to run a fluorescent lamp for 146 hours. Imagine if every sidewalk and low-traffic street in every city was covered with these tiles. Human movement itself could become a powerful generator for the world’s energy requirements. If you’re looking for a way to motivate your students to walk or run on a regular basis, check out the PaceTrek.com website. Founder Paul Staso has developed a series of events in which he takes students on a virtual walking or running adventure. 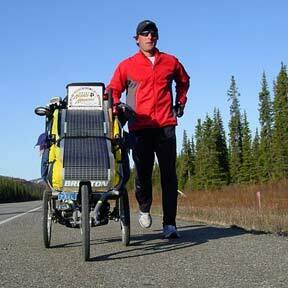 As he performs ultra-endurance runs across different countries, states and geographical areas, students are invited to watch his progress on his website, and log enough combined miles so they match the distance he’s run. Students log in miles in school gyms and playgrounds, to keep Paul company. They read his online journal and watch the videos that he films as he runs. His daily journal provides information about the place he has just run through in addition to a tip about fitness and health. It’s a great way to teach students about other places, while developing a fitness habit. Paul and his wife, Vicki. began the P.A.C.E. Fitness Foundation (P.A.C.E. stands for Promoting Active Children Everywhere) in 2006, when he ran 3260 miles across America to keep a promise to 97elementary school students in his hometown of Missoula, Montana. Since then, he’s run across Alaska, Montana and Germany. 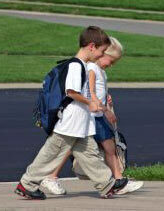 The foundation also provides information for the Safe Routes to School program. This program enourages community leaders, schools and parents to improve safety and encourage more children to safely walk and bicycle to school. To check out the PE Update.com website, Click Here! To subscribe to the free Fun Stuff for PE Newsletter, Click Here! In most of the world, people walk to get places. They walk to school, they walk to work. If they don’t walk, they ride a bike. However, in North America, our car-culture has given us a generation of children who don’t consider their feet to be a mode of transportation. The bus takes them to school. If the bus doesn’t stop at their front door, parents give them a drive to the bus stop. Mom and Dad drive them to activities – including sports activities. Their friends drive them to the mall. They have the impression that anywhere worth going to is too far to walk, when in fact, that walk might take only 15 minutes. It may not actually BE a long walk, but it might seem far when you’ve only ever driven it. One of the best things you can do in PE class is to make your students walk around your neighborhood. Show them how long it takes to get places. Tell them to walk to the mall and time how long it takes. Walk for 15 minutes down a street. How far did they get? Have them walk in the rain with umbrellas. Have them walk in the snow. Make these classes an exercise in transportation. Show them that their feet weren’t just designed for standing…or even for sports. They were designed to get them places. And amazingly, their feet can get them places in bad weather. Show them that walking is basic human transportation…in addition to one of the best fitness activities they can perform. These classes will give them a feeling of freedom when they realize they don’t have to depend on Mom and Dad to drive them everywhere. Tell them to think of it as an exercise in personal freedom and emancipation from their parents. That’s an easy sell for most kids! Heck – during these activities, they may even walk by their house. The house they take a bus from every morning. As the new school year begins, I thought we’d experiment with a new look for the PE Update blog. And to kick off our new look (which I may change at any minute, by the way) here’s a video demonstrating the latest fitness craze. OK, maybe not a “craze,” but this workout combines walking and dancing and can be done by people of all ages and fitness levels. And it can be performed anywhere with no special equipment, as long as you can play music. So your students can use it walking between classes (with apologies to your principal), to and from school, and to the corner store to pick up a loaf of bread. Watch the later segments and you’ll see how group dance walking looks. It’s a great way to make an impression in your local downtown. And who knows, a dance walk around school grounds has all the elements you need for a fun PE class! Copyright © 2019 Physical Education Update Blog. All Rights Reserved.